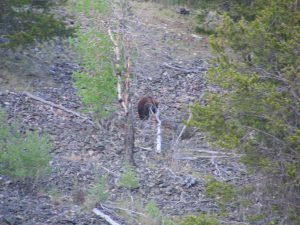 Fishing Report, Snowpack, Varney Bridge Update, and the Bears are Waking Up! Thank you to all that stopped by our booth a few weeks ago at the 3rd annual Fly Fishing & Brew Fest in Plano, Texas! We met some fantastic people and enjoyed all that Texas had to offer – most of all the warm weather! 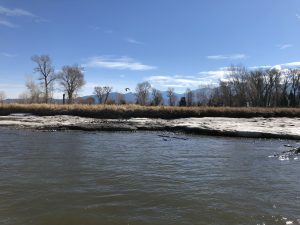 We are finally seeing some spring-like conditions in southwest Montana; we even had several Sandhill Crane sightings on the Jefferson River on April 3rd – a sure sign of spring! The fishing bug is itching every angler around and we are seeing more than the usual amount of anglers out for this time of year. However, in comparison to the peak tourist season, it is still quiet on our waters. Madison River – At last, boat access to much of the river is accessible! Boat ramps are open from Lyons Bridge to 8-Mile Ford in the Madison Valley. Ramps are also open on the lower Madison from Warmsprings to Greycliff south. We have had some Skwala action from McAtee Bridge down the river. Pats Stone size 8 in olive will put plenty of fish to the net. Fish this Pats Stone about 4′ under an olive Chubby Chernobyl size 8-10 and you will have a couple eats on the surface if you are persistent! Try these two march brown nymphs- gold bead Poxyback March Brown in a size 14, or the Hunchback March Brown in size 14. Baetis nymphs are fishing equally as good as the March Brown nymphs. Don’t forget to fish the attractor’s patterns with the smaller mayfly nymphs to get the fishes attention- San Juan worm and egg patterns – the fish will eat them too. CFS at Varney Bridge is holding at 1300. 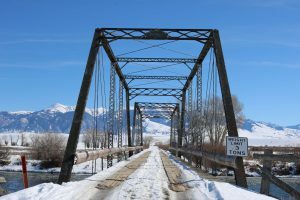 Varney Bridge on the Madison River – The iconic bridge is now closed for removal to make way for a much needed safer bridge. The bridge will be closed through the entire season with a projected reopening at the end of 2019. Varney Bridge was built in 1897, and it has served us well. If you are planning on fishing near or floating past Varney during construction you can text the word VARNEY to 22828 to receive up to date information. You can also call (406)465-3350, or email Brandon@rbci.net for information. The Varney fishing access site above the bridge will stay open during the construction. However, there will be temporary river closures, “potentially 2-6 hours,” when construction activities pose a risk to river users. Boats will be directed through the construction area. Missouri River – Land Of Giants (L.O.G.) boat ramp at the Gates of the Mountain Marina just opened up (from ice) on 4/5/19 to launch the jet boats! This is the time to be on this section of the Missouri River! These fish have had no pressure since November 2018 and they will be on the feed. Get it while the getting is good! Fished best from now through the end of May. The Mighty Mo in the drift boat section below Holter Dam near Craig, Montana is a sure bet too. Midge patterns, sow bugs, fire bead sow bugs, Baetis nymphs, San Juan worms, and egg patterns will be the flies of choice. For the dry fly angler, have your midge box with you, you will need it. Buzzballs and Midge Clusters in size 18 should get the job done. 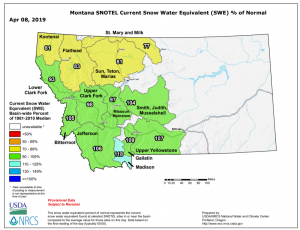 CFS below Holter Dam is holding around 5600 with water temps from 36-38. Gallatin River – Walk and wade fishing the Gallatin near Bozeman, Montana has been productive especially if you are willing to walk a short distance from the public access locations (remember to stay within the ordinary highwater mark as not to trespass on private land.) Nymphing has been best with a Rainbow Warrior size 18, Green Machine size 18, $3 dip size 16, red and orange San Juan worms and egg patterns Currently 400 cfs at the Gallatin Gateway gaging station. Jefferson River – This can be off of most anglers radar, but don’t underestimate this fishery this time of year! A majority of the ramps are clear from Twin Bridges, Montana to Sappington Bridge. Water clarity is currently sitting at 12-16″ and the CFS (cubic feet per second) at Twin Bridges is holding steady at 1500. Skwala nymphs and adults, March Browns, and Baetis are the current bugs of choice on the Jefferson River. Also, fish the San Juan worm in red. For the streamer anglers, a Kreelex silver and gold are best with a medium to slow retrieve. The fish are holding in the inside corners, walking speed, and about 3′-4′ in depth. Look carefully at the image on the left and you will see two Sandhill Cranes in flight – you know spring has sprung when they arrive! 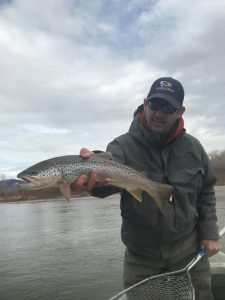 Photo number two – A Kreelex eating brown from the Jefferson River on 4/3/19. There have been reports of bears being spotted in and outside of Yellowstone National Park. This time of year they are coming out of hibernation and looking to fill those bellies. 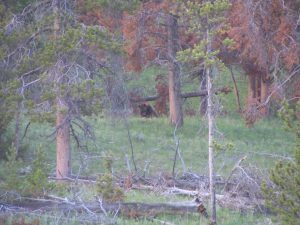 If you are fishing in areas around YNP make sure to carry your bear spray and know how to use it. Have the bear spray readily available, not stored in your vest or pack. Yellowstone National Park opens to fishing the Saturday of Memorial Day weekend. This year that date is May 25th. This is a spring Grizzly bear that was seen a few years ago dragging a roadkill deer carcass up this scree field like a toy doll to an enjoyable spot with a view to eat it. This was located on the Gallatin River near Specimen Creek in YNP.